Ingredients include bay oil, orange oil, cinnamon oil, fir needle oil, lavandin oil, cedarwood oil, clove oil, sage oil, lemon oil, patchouli oil, bay leaf, clove powder, cinnamon powder. 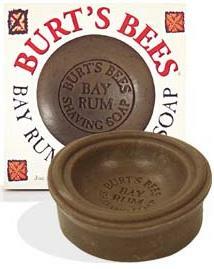 Where may I purchase Burt's Bees Shaving Soap? No one seems to carry it any longer.